All-around fitness with the Klarfit Galaxy Step mini stepper: it is the perfect home trainer to increase your fitness and requires extremely little space! In addition to improving your endurance, simple and challenging training with the Galaxy Step mini stepper will help shape your legs, buttocks, and hips and get your metabolism going. This makes a difference that leads to your body feeling noticeably better after just a few training sessions. Thanks to the included power ropes, you not only strengthen the aforementioned muscle groups, but at the same time also strengthen your arm and chest area. And if you want to support your training with delicious recipes, there is the free Klarfit Fitness eBook to download. Directly on the LCD display of the training computer, you can view performance data such as calories burned and levels per minute, while an adjustable timer supports your training with the selected time. The hydraulic shock absorbing system and the large rubber-coated premium treads provide a non-slip tread and slightly damped impact at all times to protect your joints and tendons. Due to the extremely large treads and the robust construction, the Galaxy Step mini stepper is also easily suitable for people with all kinds of training shoes and a weight up to 120 kg. The non-slip rubber feet ensure the secure stance of the mini stepper and absorb the impact of complex step choreographies: this not only protects the floor, but also the nerves of your neighbors. 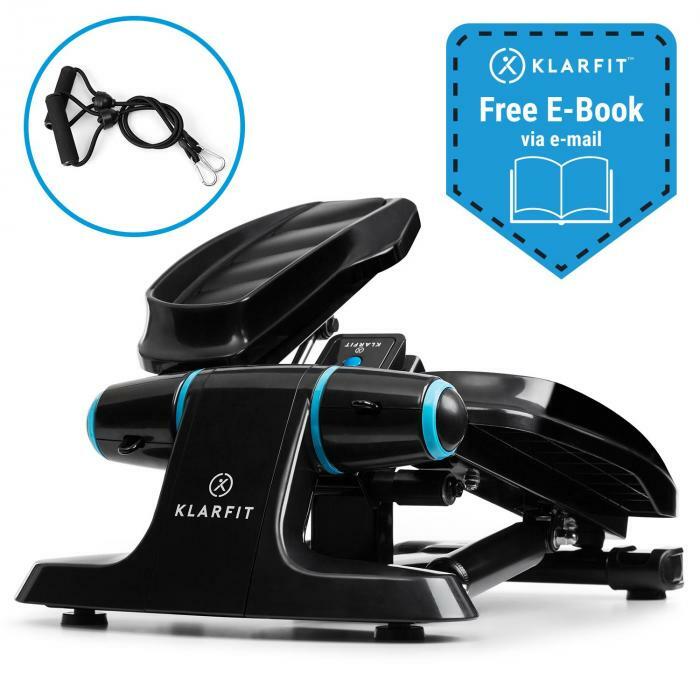 A great home device that gets you in motion: the Galaxy Step mini stepper by Klarfit!